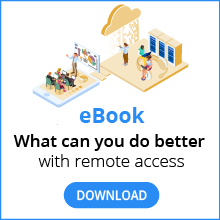 You can manage all your remote computers with cloud connectivity enabled, and the people permitted to access those computers, online. Sign in to your RealVNC account. You cannot manage your team online if you have an Enterprise subscription and only establish direct connections. These teams are completely separate. When you sign in, please make sure you are working with the right team. If you have a Home or Professional subscription, cloud connectivity is automatically enabled as soon as you license VNC Server. If you have a Enterprise subscription, you must explicitly enable cloud connectivity. For a Home or Professional subscription, this means the computer will no longer be remotely accessible; you will need to make a desk-side visit to enable it again. For a Enterprise subscription, you may still be able to establish direct connections to the computer (depending on the network), though note removing a computer may have licensing implications. If you have an Enterprise subscription, you can also remove a computer at the command line. You can invite people you trust into your team by clicking the Invite people button on the People page of your RealVNC account. If you have an Enterprise subscription, we recommend mandating that every team member enables 2-factor authentication. Has the User role. This means the person can use VNC Viewer to discover and connect to remote computers, but cannot manage the team. See how to promote people. Can automatically discover all the remote computers in your team. See how to restrict discovery. You cannot remove the team owner. Contact us if you need to change ownership. You can promote team members to help you manage the team, which may be useful if you have a Professional or Enterprise subscription and there are many computers and people in the team. A User can sign in to VNC Viewer using their own RealVNC account credentials in order to discover and connect to remote computers. This is the default role. This person cannot manage the team. A Manager is a User who can additionally sign in online and manage computers, people, permissions, and roles. An Admin is a Manager who can additionally sign in online and add capacity and renew subscriptions. The Owner is you. You can do everything, including managing payment methods and changing billing address for all the teams you own. If you have a Professional or Enterprise subscription, you can divide responsibility for remote computers among the people in your team by assigning discovery permissions on the Computers page of your RealVNC account. There’s no way to bypass our discovery service. If a team member does not have permission to discover a particular computer, they cannot possibly establish a cloud connection to it. Those not explicitly named will be denied access. If there’s no-one in the list, the computer will be inaccessible. Alternatively, you can group computers together on the Computers page and then assign team members to groups, if it makes it easier. You can even create groups of people on the People page and then assign people groups to computer groups on the Computers page.